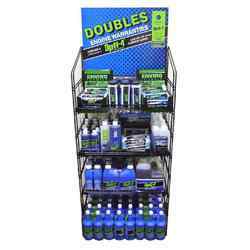 Order Interlube's quick-moving products display package and receive a FREE displayer. It assembles in seconds and becomes the perfect silent salesman when used with the FREE P.O.P. materials provided. Small quantities of each top selling product provides you maximum representation with minimum inventory. Display turns only 3.75 square feet of floor space into the most profitable part of your store.